Young women participate in a Girls Can Code! technology camp in Zambia. WASHINGTON – In Zambia, 3,600 girls have learned to code through an innovative project designed by Peace Corps volunteers. The project, known as Girls Can Code!, teaches adolescent girls from rural and disadvantaged communities to code by harnessing the power of Raspberry Pi, a low-powered computer designed by a former Cambridge University professor. At Girls Can Code! technology camps organized throughout Zambia by Bevington and his fellow Peace Corps volunteers, girls first learn basic computer skills, from typing to using a mouse. By the end of the camp, they are skilled in popular programming languages such as Python and Scratch. “This youth camp goes above and beyond to try to educate young women on how to live and think in new ways,” said Peace Corps volunteer Lillian Hill, of State College, Pennsylvania, who facilitated a camp in the Northwest province of Zambia in January. The camps combine coding, gaming, robotics, and computer architecture with lessons on HIV awareness and leadership. There is also a special focus on “ubuntu,” an African Bantu belief that emphasizes humanity toward one another. The camps are facilitated in partnership with the Zambian non-profit, Hackers Guild, comprised of young, tech-savvy Zambians who love computers, technology, and programming. Working in collaboration with Zambian trainers, Peace Corps volunteers directly reached 112 young women and girls in the first year of the program. 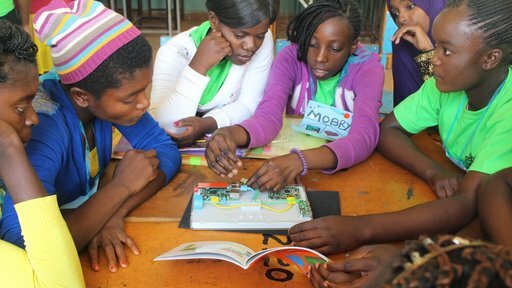 Empowered with new knowledge and technical skills, the initial group of girls have since developed their own community coding clubs in rural areas around Zambia, creating an expansive network of 3,600 young women coders. Elizabeth, who wants to be a software engineer when she grows up, now leads her own technology club for an enthusiastic group of 20 girls and boys between the ages of 11 and 13. Technology will take over the world one day, she says, and she wants young women and girls to be ready when it does.